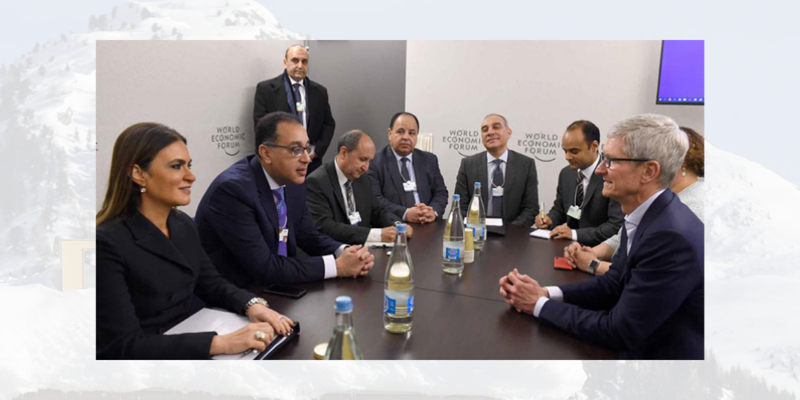 Egyptian prime minister Mostafa Madbouly met with Apple CEO Tim Cook at the World Economic Summit yesterday. The two, according to a government statement, discussed investment opportunities for Apple in Egypt. Tim Cook expressed interest to invest in Egypt saying that the company is already examining few potential areas for investments. The CEO added that there are currently 38,000 developers in Egypt building different apps for iOS. The prime minister of Egypt said that the country is working on an ambitious plan to overhaul the education system. As one part of the plan, Egypt aims to provide 750,000 tablets yearly to high school students, the prime minister noted, adding that Apple can benefit from this by bidding for the project. Apple CEO said that his company is open to cooperating Egypt in the field of education and looks forward to meeting with the government officials again to share company’s experience in EdTech across the world. The Egyptian PM who was accompanied by a delegation of ministers and other government officials including Minister of Investment Dr. Sahar Nasr, invited Tim Cook to visit Egypt. Egypt’s competition watchdog, last month, had accused Apple of violating country’s antitrust regulations and had given the company 60 days to take corrective measures. It is not clear whether this was discussed during the meeting.